Tweet Yesterday Sept 30th was National Podcast Day. 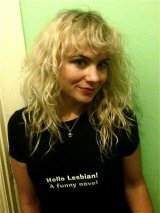 As a podcaster (www.ihatecritics.net) I feel like I should write something about it. Podcasting is still very much a punk rock/indie kind of thing. Kevin Smith, Chris Hardwick, Marc Maron etc etc have carved out their own share of the market, but there is still no podcasting U2 or Howard Stern, and I don’t think there ever will be. Just about every podcast is very independent. At this point nobody is crying sell out and where seeing big things happen for podcasters. Maron has a TV show, Hardwick is hosting just about everything. Jay Mohr got a radio show. Kevin Smith made the movie “Tusk” out of a podcast and on and on. My favorite podcast is “Tell ‘Em Steve Dave.” As a massive Kevin Smith fan I naturally checked out as many SmodCo Podcasts as I could. Many of them I still listen to, but there is something about “Tell ‘Em Steve Dave” that stands above the rest. That something is a sense of community. On one hand you have Kevin Smith who in his own right is a Hollywood heavy weight (that’s not a fat joke) on the other hand you have three regular guys who just happen to be friends with Kevin Smith. This show is not good because of Kevin Smith, it’s good because of the dynamic between the three hosts. 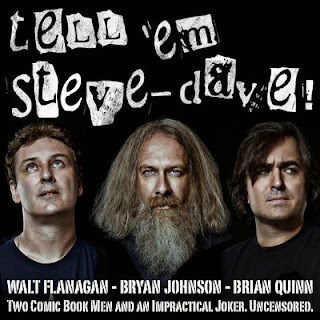 “Tell ‘Em Steve Dave” is made up of Bryan Johnson and Walt Flanagan from the TV Show “Comic Book Men” and Brian Q. Quinn from the show “Impractical Jokers.” This podcast started before both TV shows (in fact it inspired “Comic Book Men”), so we got to know the guys before they became more famous on TV. There is a sense that of everything they do, “Tell ‘em Steve Dave” is the one thing they love the most. The fan (the Ants if you will) are loyal to them, and they’re as loyal right back. I really enjoy podcasts about comedy or from a comedian. Stand-up comedy is one of the most impressive things to me. What’s also impressive to me are comedy podcast with just one host. 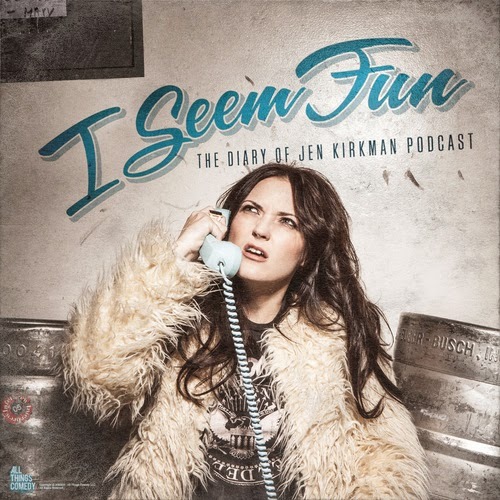 Ben Gleib and Jim Florentine have two great podcasts where for the most part they are by themselves, but “The I See Fun Podcast: The Diary of Jen Kirkman” may be the best. I enjoyed “Chelsea Lately” but it was more so because I got to discover several comedians like Sarah Colonna, Jen Kirkman, Josh Wolf, Ben Gleib, April Richardson (all of which have podcasts) etc etc. Jen’s podcast lets you inside her head, but she controls what you see and what you don’t, but she does this almost effortlessly. I have a hard time keeping a conversation going in real life with another person, she’s home alone just talking to herself and has yet to release a podcast that has lost my interest. She is first and foremost hilarious. Her podcast is incredibly smart and honest. I love getting into the head of a great comic. Similar to “Tell ‘em Steve Dave” she’s built a tight loyal following that is going to come out to her shows when she comes to town. Because of this podcast I’ve been turned onto her standup. She has become one of my favorite comedians and I’m hoping to see her live in early 2015. Several of my friends have podcast that I’d like to briefly share that you should check out. Moped Jones Drunken Podcast – Aspiring actor and standup comedian Jason Schaver get drunk, listens to music, talks about his favorite movies and tells stories. Mommy’s Cocktail Hour – It’s my wife’s podcast that she does with three other mothers. The Awesome 80’s Podcast – It’s a podcast dedicated to 80’s pop culture.